TCM also believes that the human body is a microcosm of a universal macrocosm. Therefore, humans must follow the laws of the universe to achieve harmony and total health. The Yin/Yang and Five-Element theories are actually observations and descriptions of universal law created by God and not concepts created by man. In ancient times, practitioners of TCM discovered these complex sets of interrelationships that exist on deep energetic levels below the material surface. Over time, these insights developed into a unified body of wisdom and knowledge. TCM theories were applied to a way of life and to healing the human body. Even today TCM practitioners use these essential theories to understand, diagnose and treat health problems. 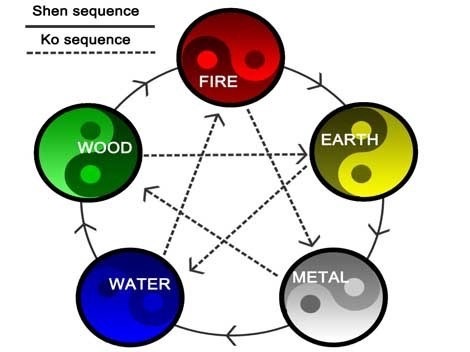 The Five-Element Theory is the bedrock of TCM. It evolved as a way of naming and systematizing patterns of apparent related phenomena, ranging from something as tangible as the weather to more rarified realms such as emotion and capacities of character, into five major groups named for the universal elements: Wood, Fire, Earth, Metal and Water. The Five-Element Theory states that the five major Organ Systems: are each related to a particular element and therefore to a broad category of correspondences or classifications: from a season of the year to a time of day, to particular colors and foods, etc. Both the Yin/Yang Theory and the Five-Element Theory reflect the entire Universal law in one complete, comprehensive system of related categories. TCM does not consider the Five Elements themselves to be inert substances. They are fundamental energies alive in nature and always in motion. The Five-Element Theory encompasses two dynamic relationships, generation and control, that explain how the five major Organ Systems are interconnected. Each element generates, or gives energy to, another. These element pairs are known as mother and child. Each element also restrains or controls another. The proper amount of control keeps all the elements in proportion. With control, one Organ System acts as a feedback loop for its opposite pair as well as its partner Organ to keep them functioning smoothly: neither excessively nor deficiently, neither too strong nor too weak. These dynamic interactions enable all the Organ Systems to work in one harmonious, greater system. If their relationships are good, a state of wellness prevails; if any of the relationships become unbalanced, health problems result. The Five-Element Theory gives a skilled TCM physician a range of options for addressing health problems. For instance, when a patient presents with skin problems, the TCM physician understands that the Organ System of the Lung and Large Intestine are involved because the skin is the "tissue" of the Lung (according to the Five Element Theory). Therefore, the physician can decide to heal one or both Organs to treat the root cause, not just the symptom of the skin problem. In western medicine we would treat for the outward physical manifestation through medication and not always consider an underlying issue. In the use of TCM and Integrated Medicine they treat not only the outward but also the underlying cause of physical manifestations of a disease process.